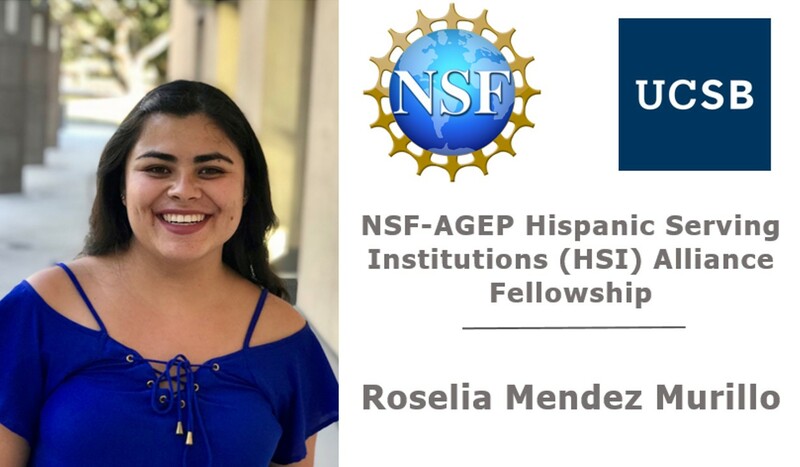 Congratulations to doctoral student, Roselia Mendez Murillo, who has been competitively selected to participate in a National Science Foundation award entitled “The AGEP California Hispanic Serving Institutions (HSI) Alliance to Increase Underrepresented Minority Faculty in STEM.” The funded project is in partnership with UC Santa Barbara, UC Merced, CSU Channel Islands, and CSU Fresno. Project Goals: The overall goal is to broaden the professoriate by creating pipelines for students of diverse identities into faculty positions at a broad array of institutions of higher education. The program provides doctoral students with relevant pedagogical training for teaching at diverse colleges and universities, pairs them with faculty mentors at a CSU campus, and provides them with an opportunity to spend time in CSU classrooms. Project Description: Roselia Mendez Murillo, and five other Ph.D. students at UCSB, were competitively selected as Fellows. She will participate in a two-week pedagogy institute at UCSB, be paired with a CSU Channel Islands faculty mentor, work with the faculty mentor to teach and assess a series of pedagogical activities, and receive mentoring throughout the process of applying for academic jobs during her dissertating year. Financial Award: Payment of tuition, full fees, health insurance, and travel costs, as well as a stipend during summer 2019 and fall 2019 (this includes fall quarter off from teaching). Payment of tuition, full fees, health insurance, and travel costs, as well as a stipend during fall 2020 (this includes fall quarter off from teaching).